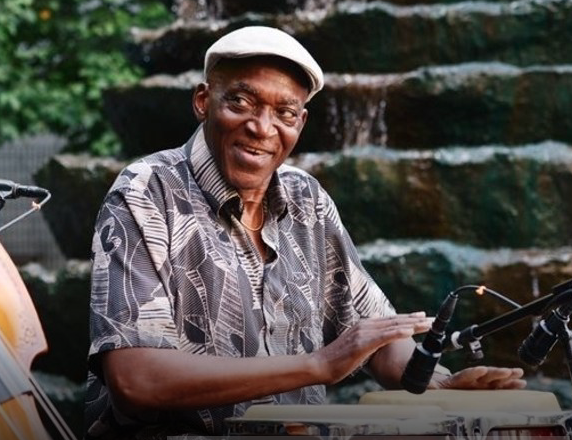 Percussionist George Jones has been a mainstay on the Pittsburgh music scene for more than 30 years and recognized as the finest conga player in the area. George's mother was a bass player with the famous “International Sweethearts of Rhythm”, traveling across the country until settling in Pittsburgh in the fifties She was the inspiration and motivation for George's interest and love of jazz, exposing him to “Jazz at the Philharmonic” at an early age. During a stint in the military in the sixties, George played on pots and pans - anything he could get his hands on - and developed his interest in African drums and rhythm. George returned to Pittsburgh, where he was further encouraged by Eric Kloss and Roger Humphries. George has performed countless concerts and club dates with Pittsburgh jazz greats and internationally known artists Pharoah Sanders, Richard 'Groove' Holmes, Ray Mantilla, and Larry Coryell. In 1984, George co-founded the seminal Latin Jazz group “Salsamba” with guitarist Eric Susoeff, recording six CDs with the band. George continues to play and teach in the Pittsburgh area.